Filled with Turkey and ready for more magic, we're back with two delightful comedy performers on Magic Tonight. On Thursday at the Franklin House in Streetsville, we have Jason Palter, winner of the Canadian Event Industry's "Entertainer of the Year" award and a fabulously zany performer, with no setting between high and off, who will be unleashed on our Mississauga Guests. This Sunday at the Crimson Lounge in Toronto, we have Chris Mayhew. Chris was the co-star of Sketchy Magic earlier this spring and has presented his hilarious one-man show Mayhew Mayhem off-off Broadway in New York and also so far off-Broadway it was actually in Montreal. Tickets for the shows are available online and for all of our upcoming performances. Readers of this blog can use the code reality for a discount on the price of tickets and dinner when purchasing online. On this week's show at the Crimson Lounge downtown, I'll be joined by comedy magician extraordinaire, Chris Westfall. Chris appeared for a month here with his partner in absurdity Chris Mayhew performing Sketchy Magic and he's about to embark on a Canada-wide tour of his family show, Chris Westfall and the Porcelain Princess. Chris is always funny and always zany and we're delighted to unleash him for you this Sunday. Tickets are available for our September dates at www.MagicTonight.ca/tickets. We have spots for Toronto and a very limited number for the Franklin House in Mississauga. Readers of this blog can use the code reality for a discount on the price of tickets and dinner when purchasing online. This Sunday, I'm off at the Soulo Theatre Festival, so filling in for me on stage at Magic Tonight is a dynamic duo the likes of which the world has never seen! 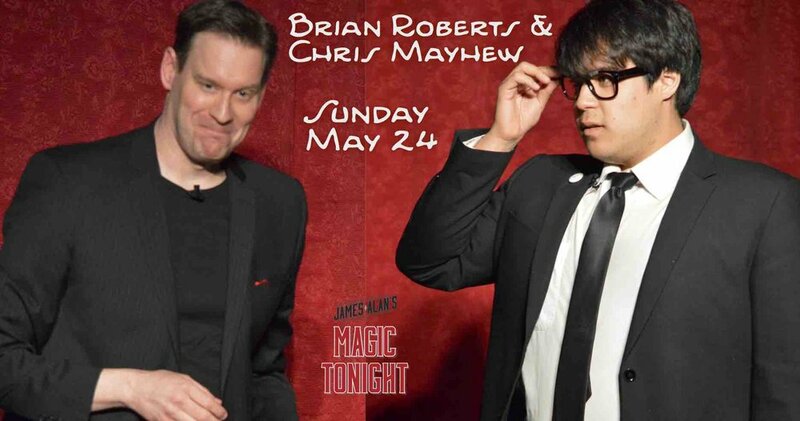 Combining forces, we have the incredibly funny Chris Mayhew (who recently appeared as part of his own two-person show, Sketchy Magic, and as a guest at the world famous Magic Castle in Hollywood) and the ridiculously tall virtuoso sleight of hand performer Brian Roberts. They've assured me that while the boss is away, they'll be out to play. So anything could happen. Grab your tickets now for this exciting (and potentially catastrophic) experience. Magic Tonight is performed weekly at the Crimson Lounge in Toronto and the Franklin House in Mississauga. Readers of this blog can use the code reality for a discount on the price of tickets and dinner when reserving online. The final show of Sketchy Magic at the Crimson Lounge was last night. It was a completely sold out run or four shows. This show featured a trio of sketchy live artists preparing unique works of art before the show. Thank you to everyone who came out to support this new show. It will be back later this year with more amazing and hilarious magic. In the mean time, take a peek at what we got up to. The magic continues at the Crimson Lounge with Magic Tonight. Readers of this blog can use the code reality for a discount on the price of tickets and dinner when purchasing online. The Sketchiness continues with another sold out show. There is just one more chance left (Tuesday, April 28) to catch these comedic wizards before they disappear... and probably turn into something something more strange and inexplicable. If you haven't had a chance to check out the show, take a peek at what you missed. Readers of this blog can use the code reality for tickets to Sketchy Magic when purchasing online.